How can it already be October? Before we know it, Halloween will be here, then Thanksgiving and shortly after that... Christmas! Since starting Nutrisystem back in July, I've been thinking about all of the delicious holiday treats that I look forward to enjoying every year. This year I'm still going to enjoy them, just in a different capacity! The Nutrisystem program has taught me the value and important of proper portion sizes. It was never a secret to me that I had issues with portions, and I realize that it's a huge factor to my weight loss success! That brings my total weight loss to 28 pounds! After a 0 pound weight loss last week, I was thrilled to see that number on the scale drop this week! I don't think I could have handled to zeros in a row! However, I was also reminded this week that my road to weight loss is a journey and not a race. Those words of encouragement were exactly what I needed to hear! Wow! You are doing an amazing job! 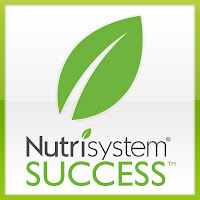 I am definitely going to give NutriSystem a try! Keep up the great work!! 28lbs! That's so great. Keep up the awesome work! 3lb loss! That's awesome! Way to go! 3 lbs! Yay! That's awesome good for you and what a wonderful overall weight loss. Congrats! Wow, you are doing awesome on Nutrisystem! Congrats on the 3 lbs! Congratulations!!! You are doing awesome!!! You are doing so well! You are rocking this!! Another awesome week! You rock! You really have done an amazing job, you are such an inspiration to me! Thank you all so much for your encouraging words! It really means a lot to me! You are doing awesome! Woohoo! Keep up the great work! congrats on all your pound lost!! Way to go! So happy to read about your progress! Congrats!